Operating since 2004, the BetOnline Mobile Sportsbook is all about giving players a chance to bet on sports and other contests from their mobile device with a minimal amount of fuss. Everything is designed from the ground up to give players a flexible, easy-to-use app that is the foundation of a great overall experience. They are licensed to operate in Panama, and they have a really good reputation that stems from giving players reliable withdrawals and a lot of good promotions. From the very beginning of your time at BetOnline, they have set everything up so that you get a ton of value for your wagering. You start off with a great 50 percent match bonus on your initial deposit, and you only need to deposit at total of at least $50 to take advantage of this offer. It’s worth a maximum of $2,500, which means a pretty significant boost to your starting bankroll, and there’s a simple 10x wagering requirement that you have to meet before you can cash out. Many mobile sportsbooks would give you a bonus on your first deposit and then leave you hanging for every deposit after that. Instead, BetOnline gives you a different approach with a lifetime bonus worth 25 percent on every single deposit that you make after your first one. You’ll get 25 percent worth up to $1,000 with a minimum deposit of $50 on your second, third, fourth, fifth and every deposit after that for the entire life of your account. 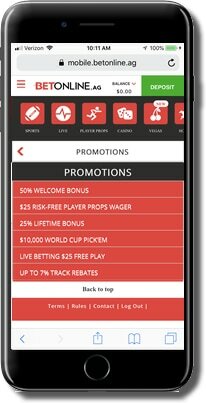 We feel that this lifetime bonus offer does set them apart in the promotions sector from the other brands covered in our mobile betting app reviews. The wagering requirement is lower than the welcome bonus at a very fair and balanced 6x, and you can claim this offer as many times as you want with the LIFEBONUS promo code. The interface used with the BetOnline Mobile Sportsbook is completely based on using your web browser. What will happen when you bring up their website on your smartphone or tablet in your Internet browser is that it will automatically detect the device you’re using and its screen size and adjust itself accordingly with their mobile web app at an appropriate scale. This makes sure that the controls are always at a comfortable size, and you never end up with a situation where the buttons and controls are too small for the screen size that you’re dealing with. To use this interface, all you have to do is log into their website with your account username and password. The app itself will handle the rest, and you’ll be able to place bets or manage your account in moments, including their advanced features such as live betting. They used this web-based app because it makes it easy for players with all different kinds of devices from all different types of operating systems to get in on the action. Smartphones, tablets and any other devices that run on iOS iPhone and iPad, Android, Windows Mobile or Blackberry will be able to connect in the same way using the same interface without you needing to download any kind of app. One of the problems that many players have with betting on sports using a mobile device is that the interface can be difficult to navigate if it hasn’t been developed in an intelligent and organized way. 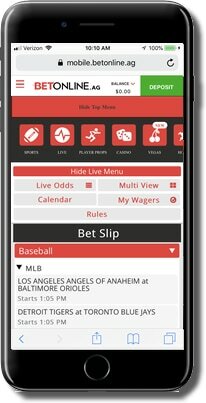 With BetOnline Mobile, you’ll have a very clean and easy-to-use interface that’s based around making it easy to find the exact games, matches and contests that you want to wager on without a problem. The key to this is how everything is nested from the top down, so you can make just a few taps on your screen to get exactly where you’re trying to go without getting lost or having no idea where to go to find what you’re looking for. So here’s how this works when you log in. First, you’ll see a list of the most popular sports that players wager on. These come under the “Main Sports” heading, and the idea is to make it as quick as possible for most players to go to exactly what they’re looking for most of the time. If you want to wager on other sports, it’s no problem because all you have to do is scroll down until you find what you’re looking for. Once you choose a sport, you just tap on it, and one of two things will happen. If it’s a sport or section that doesn’t have a lot of events to wager on, you’ll be taken straight to the list of contests that you can bet on. However, the more popular sports will have things broken up into leagues to make it easier to narrow down what you’re looking for. Pick the league you want, and all of the available markets for the games that are available for that sport and league will show up, starting in chronological order. All of the information that you need to know about the game is right there in one place, including the odds, to make it easy to pick a wager. Once you know what you want to bet on, you’ll tap the game and place your bet. It’s that simple. The customer service team at BetOnline is available 24/7/365. They are always there to take care of whatever it is that you might need some assistance with, and they offer two different ways to connect with them. The first is a simple telephone number that can be used any time, day or night, to speak directly to a member of the customer service team. The other is an email option that is set up to be constantly monitored so that you can get a response within hours. We recommend the telephone option for players who need an immediate resolution to their issue, but the email option might be better if it’s over something like general feedback that doesn’t need an immediate response. The cashier section can be accessed using the mobile app, and that includes managing both deposits and withdrawals. Cryptocurrencies such as Bitcoin, Litecoin, Ethereum, Bitcoin Cash, Dash, as well as credit cards like MasterCard and Visa, electronic wallets like Skrill and Neteller, person to person transfers, money orders and other options are available for making your transactions. They have a solid reputation for reliable withdrawals as well, and since this reputation has been built for well over a decade, it’s clear that this is a company you can trust.